do you believe that public employees should be allowed to have choices when it comes to union representation? if you said, “yes,” Then you support union democracy. 79% of union workers believe they should have choices. 75% agree workers should have voting rights. In short, recertification election would allow public employees in Connecticut to vote on which public sector union represents them. ﻿Join us to support union recertification in Connecticut. We surveyed real Connecticut public union members. This is what they told us. A survey was fielded in October 2018 to N=302 public union members, with a margin of error of +/- 5.66%. These are their responses. 3 out of 4 believe that public union members have the right to vote on the union that represents them at the workplace. 2 out of 3 would be interested in hearing from a new or different union at the workplace. About half say they would likely keep their current union, but half say they would likely go with a new or different union or forgo union representation altogether. The question is…why, given all of this support for union democracy among real union members, won’t unions give their members what they want? It’s time to bring democracy to the union. Give union members the choice they want. Help us bring choice to the union workplace. You may have recently noticed a startling orange billboard along the freeway, proclaiming, “Bring Democracy Back to the Union!” What do these billboards mean? It means Connecticut’s public service workers are asking for the right to choose who represents their most precious rights at the bargaining table. This past December, the Yankee Institute of Public Policy conducted a voter survey, asking 1,209 registered voters across the state how they felt about the issues of union transparency and union worker voting rights. Connecticut voters overwhelmingly support the idea of union recertification election. Three out of four union members believe workers should have voting rights when it comes to choosing their union. See what else we found out in our survey of statewide public union employees. The Janus Case has been decided. What does that mean for dues paying members like me? ﻿Public employees in Connecticut have a right to not pay union fees. On June 27, the Supreme Court ruled that public employees have a First Amendment right to decide for themselves whether or not to pay a union. That means you cannot be required to pay union fees as a condition of employment. The court also ruled that it is illegal for fees to be deducted from public employees' paychecks unless the public employee is a union member or has signed a waiver clearly allowing the collection of fees. Need help resigning from your union? Click here. Or just have a story to tell us about your experience with the process? We want to hear from you, too! I recently received a letter from my union. 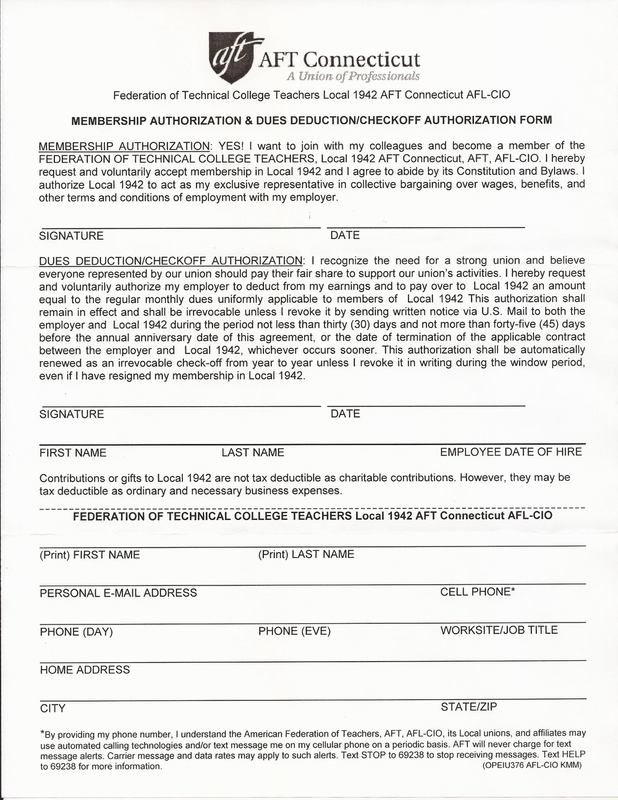 Should I sign new union membership forms or paperwork? Did you recently receive a letter from your union? Be careful before you sign it. You may be signing an "irrevocable" agreement to pay union fees for a full year, even if you wish to resign from the union. Before you sign a letter like this one from your union, make sure that you are not signing away your rights to resign from paying dues. If you have questions about whether to sign the form, click here and we will help you. CT Workers is a community for Connecticut public employees interested in talking about workplace rights. If I choose to stop paying fees to my union, won’t I lose all of the security that a union provides? No. Some things will not change whether you stay in your union or not. While collective bargaining agreements can be amended, the current contract for pensions and health care benefits doesn't expire until 2027. Likewise, an agreement made last year between the state government and unions limits layoffs of state workers until 2021. A U.S. Supreme Court ruling in the case of Janus v. AFSCME Council 31, centered around your first amendment right to freedom of speech, has now given you the right to resign from paying your state government union agency fees without losing the benefits of union membership. Connecticut's civil service laws protect state employees. The current SEBAC agreement guarantees there will be no layoffs of public workers through the year 2021. Current Connecticut civil service laws also protects public union workers' pensions and health care benefits through the year 2027. Welcome! CT Workers is a community for Connecticut public employees interested in talking about workplace rights. Our goal is to keep you up to date on what rights you have as a Connecticut public employee. We encourage public employees, their families, and any interested Connecticut citizens to join us. We are excited to welcome Connecticut workers to this community. It's important that we all know our rights. Read our FAQs. Check out the latest News. Sign up for email alerts.